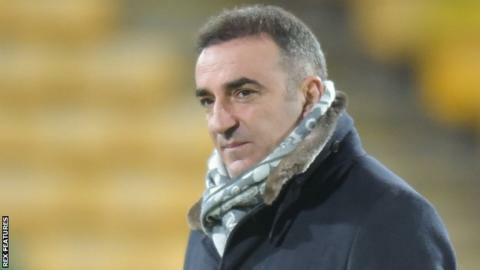 Swansea City have appointed former Sheffield Wednesday manager Carlos Carvalhal as their new permanent boss. Player-coach Leon Britton had been in temporary charge of Swansea since the Premier League's bottom side sacked Paul Clement on 20 December. Carvalhal, 52, was dismissed by Wednesday on Christmas Eve, with the Owls 15th in the Championship table. The Portuguese joins Swansea initially until the end of the season with the option of an extension. Carvalhal, the Swans' fifth permanent manager in two years, led Wednesday to the Championship play-offs in the past two seasons. The former Besiktas, Sporting Lisbon and Maritimo boss, who succeeded Stuart Gray at Hillsborough in June 2015, had a win ratio of 42.7% from his 131 games in charge. "We are very pleased with the appointment," said Swansea chairman Huw Jenkins. "We felt we needed to get the managerial situation resolved as soon as possible and while the timing is not always perfect, we can look forward to the second half of the campaign with renewed optimism." Carvalhal's first game in charge of Swansea will be at Watford in the Premier League on Saturday (15:00 GMT). He faces a daunting task in trying to steer the club to safety. The Swans have spent the past three Christmases in the Premier League relegation zone and they only narrowly avoided the drop under Clement last season. But the former Bayern Munich assistant manager was sacked after winning only three of his 18 league games in this campaign. That was the fourth managerial change in two years at Swansea, with Garry Monk, Francesco Guidolin and Bob Bradley also departing before Clement's arrival in January. The Swans are hopeful Carvalhal will be able to inspire a transformation in their fortunes similar to the end of last season. "Carlos' time at Sheffield Wednesday highlighted that he has great character and personality to lead the squad and the football club, which is vital at such a crucial time," Jenkins added. "He has built up a lot of experience over the years which will ensure the team is structured and organised. "He is driven and ambitious and while he has a big challenge ahead of him, I know he will tackle it without fear." Carvahal likes to play football, he likes to get the ball into the strikers, and has spent a lot of money on strikers. I think it's a good appointment. It gives Swansea a little bit of hope and that little bit of a chance to get out of trouble that they're in. If Swansea were to go down, he's somebody who's got to the playoffs with Sheffield Wednesday. And they might keep him. That may also be in Swansea's thinking.